1st Session. J I No. 16,,. Luis Someillan y Vidal, citizens of the United States. MARCH 13, 1896.-Referred to the Committee on Foreign Relations and ordered to be printed. 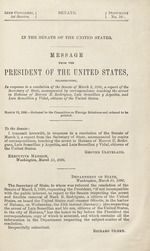 I transmit herewith, in response to a resolution of the Senate of March 2, a report from the Secretary of State, accompanied by copies of correspondence, touching the arrest in Habana of Marcos E. Rodriguez, Luis Someillan y Azpeitia, and Luis Someillan y Vidal, citizens of the United States. The Secretary of State, to whom was referred the resolution of the Senate of March 2,1896, requesting the President, "if not incompatible with the public interest, to report to the Senate respecting the arrest and forcible removal of Mark E. Rodriguez, a citizen of the United States, on board the United States mail steamer Olivette, in the harbor of Habana, on Wednesday, the 15th instant (January); also respecting the arrest of Luis Someillan and his son, citizens of the United States, in the city of Habana," has the honor to lay before the President the correspondence, copy of which is annexed, and which contains all the information in the Department respecting the subject-matter of the resolution. ARREST OF AMERICAN CITIZENS IN CUBA. Mr. Williams to Mr. Uhl, January 19, 1896 (telegram). Mr. Williams to Mr. Uhl, No. 2721, January 20, 1896. Mr. Williams to Mr. Uhl, No. 2723, January 20, 1896 inclosuress). Mr. Williams to Mr. Uhl, No. 2724, January 20, 1896 (inclosure). Mr. Williams to Mr. Uhl, No. 2725, January 20, 1896 (inclosure). Mr. Uhl to Mr. Williams, No. 1234, January 22, 1896. Mr. Call to Mr. Olney, January 22, 1896 (inclosure). Mr. Olney to Mr. Call, January 22, 1896. Mr. Call to Mr. Olney, January 28, 1896 (inclosure). Mr. Uhl to Mr. Williams, No. 1245, January 31, 1896. Mr. Uhl to Mr. Williams, No. 1248, February 1, 1896. Mr. Olney to Mr. Call, February 1, 1896. Mr. Williams to Mr. Uhl, No. 2759, February 10, 1896. Mr. Olney to Mr. Call, February 11, 1896. Mr. Olney to Mr. Call, February 25, 1896.
gU$J/ Mr. Williams to Mr. Uhl. protocol, eighteen hundred and seventy-seven. Mr. Williams to Mr. Uhl. obtaining permission from the Department to do so. Habana, January 20, 1896. (Received January 27.) SIR: I have the honor to inclose, for the information of the Depart. ment, a copy of a communication addressed by me to the GovernorGeneral on the 17th instant, in relation to the arrest of Mr. Marcos E.
Rodriguez, a naturalized citizen of the United States, of Cuban birth, in which I asked for him the enjoyment of the guarantees of the protocol of the 12th of January, 1877; and also a copy of the answer thereto of the secretary-general, from which it appears that Mr. Rodriguez is charged with sedition and rebellion, the civil court of the cathedral district of this city being encharged with the examination of the proceedings in his case. Mr. Rodriguez has been allowed an advocate for his defense in accordance with the protocol. Mr. Williams to the Governor-General. EXcELLENCY: It having come to my knowledge that Mr. Marcos Rodriguez, a citizen of the United States, has been arrested and is now detained at the police headquarters, deprived of outside communication, I have, therefore, and in compliance with the instructions of my Government, to ask your excellency to be pleased to inform me of the reasons of his arrest, and that I be allowed to communicate with him; and, also, that whatever may be the reasons of his arrest the protocol of January 12, 1877, between the United States and Spain be strictly observed, with the complete enjoyment of its guarantees for his defense, and consequently to allow him to communicate freely with the lawyer and solicitor he may appoint. The Governor-General to Mr. Williams. By order of his excellency the Governor-Generol, I have the honor to acknowledge the receipt of your three communications of this date, and to inform you that the parties under arrest, Marcos Rodriguez, Luis Someillan y Azpeitia, and Luis Someillan y Vidal, have been subjected for trial to the ordinary jurisdiction, on the suspicion of being guilty of acts of sedition and rebellion, the judge of instruction of the cathedral district being encharged with the examination of the proceedings by virtue of a request of the prosecuting attorney of the superior court of Habana; and also that the accused may appoint advocate and solicitor for their defense, giving them personally the instructions which they may desire, at their prison, to which effect the president of the superior court of this territory will be communicated to-day. I am, etc., FRANCISCO CALvO MuNoz. protocol of the 12th of January, 1877. The secretary general answered me in a communication on the same day, copy and translation of which accompany my previous dispatch, No. 2723, of this date, from which it appears that Mr. Someillan is charged with sedition and rebellion, the civil court of the cathedral districk of this city being encharged with the examination of the proceedings in his case. I understand that Mr. Alfredo Zayas, of the Habana bar, has been engaged for his defense. EXCELLENCY: Having received information from Mrs. Josefina Someillan de Hernandez to the effect that her father, Mr. Luis Someillan y Azpeitia, a citizen of the United States, has been arrested and is now detained at the police headquarters and deprived of outside communication, I have, therefore, and in compliance with the instructions of my Government, to ask your excellency to be pleased to inform me of the reasons of his arrest and that I be allowed to communicate with him; and also that, whatever may be the reasons of his arrest, the protocol of January 12, 1877, between the United States and Spain be strictly observed, with the complete enjoyment of its guarantees for his defense, and consequently to allow him to communipate freely with the lawyer and solicitor he may appoint. Sr : I have the honor to inclose, for the information of the Department, a copy of a communication addressed by me to the governorgeneral on the 17th instant in relation to the arrest of Mr. Luis Someillan, jr., a naturalized citizen of the United States of Cuban birth, in which I asked for him the enjoyment of the guaranties of the protocol of the 12th of January, 1877. The secretary-general answered me in a communication on the same day, copy and translation of which accompany my dispatch, No. 2723, of this date, from which it appears that Mr. Someillan, jr., is charged with sedition and rebellion, the civil court of the Cathedral district of this city being encharged with the examination of the proceedings in his case. I understand that Mr. Alfredo Zayas, of the Habana bar, has been engaged for his defense. I am, etc., RAMON 0. WILLIAMS. 77. The secretary general answered e day, copy and translation of which No. 2723, of this date, from which it ,ged with sedition and rebellion, the k of this city being encharged with ngs in his case. I understand that >ar, has been engaged for his defense. oN O. WILLIAMS, Consut.- Geeral. ceived information from Mrs. Josefina Someillan de He r father, Mr. Luis Someillan y Azpeitia, a citizen of 1 )sted and is now detained at the police headquarters an nication, I have, therefore, and in compliance with t ient, to ask your excellency to be pleased to inform n and that I be allowed to communicate with him; ar he reasons of his arrest, the protocol of January 12, 187 aud Spain be strictly observed. with the complete enjo; his defense, and consequently to allow him to commun and solicitor he may appoint. Mr. Call to Mr. Olney. Respectfully forwarded to the Secretary of State. Mr. Ifarris to Mr. Call. KEY WEST, FLA., January 28, 1896. (Received February 6, 1896.) DEAR SIR: Inclosed herewith you will please find a copy of the resolution as passed by Key West Lodge, No. 13, I. 0. 0. F., which explains itself. The lodge requests that you give this matter that attention which we are satisfied your well-known sympathy of the weak will warrant. "Resolved, That we do earnestly request our Senators and Representatives at Washington to urge the Department of State to adopt all lawful means to secure the release of our said brother." A true and correct copy of the resolutions as passed. W. F. HENSON, Recording Secretary. Mr. Uhl to Mr. Williams. SIR: I have received your dispatch, No. 2721, of the 20th instant, submitting a telegram addressed to you by one Otto, of Key West, Fla., relative to the arrest of Marcos E. Rodriguez. Your course in not replying to the telegram is approved. SIR: I inclose for your information a copy of a letter from Mr. C. Recio,' referred to this Department by the Hon. Wilkinson Call, relating to the arrest and imprisonment of Marcos E. Rodriguez Luis Someillan and Luis Someillan, jr. Senator Call has been informed of the substance of your telegram of the 19th ultimo, reporting that the above-named persons have been subjected to the civil jurisdiction in accordance with the protocol of January 12, 1877. I am, etc., EDwIN F. UHL. Mr. Olney to Mr. Call. SIp: I have the honor to acknowledge the receipt of a letter of the 22d ultimo from Mr. C. Recio, referred by you to this Department, relative to the imprisonment in Cuba of Marcos E. Rodriguez, Luis Someillan, and Luis Someillan, jr. A copy of the letter has been sent to the consul-general at Habana. For your further information I have to say that the consul-general, in his telegram of the 19th ultimo, reporting the arrest of the abovenamed persons on the charge of sedition and rebellion, states that they have been subjected to the civil jurisdiction for trial, in accordance with the protocol of January 12, 1877, between the United States and Spain. SIR: I beg to acknowledge the receipt of the Department's instruction, No. 1248, of the 1st instant, inclosing a copy of a letter, dated January 22, from Mr. C. Recio, of Key West, Fla., and indorsed by the Hon. Wilkinson Call, relating to the arrest of Mr. Marcos C. Rodriguez, a citizen of the United States, by the authorities of this place, and to report, with reference to previous correspondence, that just as soon as information was received of the arrest of Mr. Rodriguez this office proceeded immediately to obtain his transfer for trial from the court-martial to the civil jurisdiction, in accordance with the convention between the United States and Spain of the 12th of January, 1877, and this having been obtained, consular functions ceased and those of the advocate and solicitor commenced. Accordingly, Mrs. Rodriguez has appointed Mr. Alfredo Zayas, of the Habana bar, as advocate for his defense, and he is giving the case his assiduous attention. SIR: I have the honor to acknowledge the receipt by reference from you of a letter dated the 28th ultimo, from Mr. W. Hunt Harris, in behalf of Marcos Rodriguez, who has been arrested and imprisoned in Cuba charged with sedition and rebellion. 8 ARREST OF AMERICAN CITIZENS IN CUBA. In reply I have the honor to inform you that the consul-general at Habana is watchin g the ease of Mr. Rodriguez, and reports that he has been transferred to the civil or ordinary jurisdiction for trial, in accordance with the provisions of the protocol of January 12, 1877, between the United States and Spain. I have, etc., RICHARD OLNEY. SIR: Referring to previous correspondence on the subject, I have the honor to transmit herewith for your information a copy of dispatch, No. 2759, of the 10th instant, from the consul-general at Habana, relative to the arrest by the authorities at that place of Marcos E. Rodriguez, esq., a citizen of the United States. I have, etc., IRIcIIARD OLNEY.